But if its a firmware problem shouldn't I have an issue with everything in the house? because all the other electronics (game consoles, tablets and laptops) running on windows 7 are working fine. I brought my niece a Acer netbook and it has windows 8 but it works fine as well... My system seems to be the only one with a problem... Since we use are wireless, If I use the ethernet doesn't that mean I'm stuck sitting next to the modem? Ugh?! Seems to me I recall an issue with the M$ provided drivers for wireless. Apparently they botched them pretty badly. You might try and reinstall the drivers from manufacturers site rather than auto update version even if version number is lower. Might also be a location issue. The Arris is a decent modem with phone support but as a wireless router leave much to be desired. The internal antennae and weak signal generator means that signal tends to be directional (think oval as opposed to circular coverage). if moving the laptop around in relation to the gateway helps that is issue. If the laptop has a similar problem on other wireless netorks like free wifi in a coffee shop then it is the hardware/drivers. Eight months and 152 posts later, no fix by Comcast. Give it up folks. You need to solve your problems on your own. Don't expect any help from Comcast.They're in the profit business not the service and support business. Even when it is working well, the Arris is known for having a very short range. It has been suggested that the signal travels better if the modem is up off the floor, or in your case, I'd be sure it was on the second floor for the best signal throughout your house. The problem with the firmware is that the signal is fine, but it itermittantly "goes to sleep". Sometimes once an hour, sometimes once every five minutes, thereabout. It's random. If you are using a device and app, like my "Bonza" on my tablet, it constantly checks in with the bonza.com website, and it times out within a couple of seconds. It hangs all the time. Or it starts loading, then stops, and then times out and says I don't have an Internet connection. It all depends on how Win8 handles the DNS. If it is timing out while seeking the DNS, that would explain the problem you are having. The questions are: how often does Win8 look for DNS servers? Where is it looking? What does it do when it can't find them...keep trying, or time out with an error immediately? All of these things are dependent on both hardware and software within your PC. Each device might be handling it differently, or have different settings. The higher elevated the better. In the three-story house situation, I definitely agree with your statement regarding the router being placed on floor two. As a general rule no other electrical or wireless equipment should be placed within three feet of the wireless gateway. Do not set wireless gateways on speakers due to electromagnetic interference regardless if there is power to the speaker or not. To ensure you have the latest firmware you can check in the router settings page. You can also call tech support so they can verify you have the latest firmware updateand that your router settings are configured properly to work with the update. The "sleep"/signal drop/intermittent connectivity issue has been fixed with the latest version. There is an unexplained DNS timeout that seems to affect Windows 8/8.1 with this model wireless gateway. It is not happening across all wireless adapters. The current workaround is a reconfiguration of DNS. If this is affecting you please note your wireless adapter model. Any reconfiguration should be done by a qualified tier support technician over the phone or an on-site service technician. Well for your situation an access point would probably help a lot. Rather than repeating a weak signal it provides a strong connection point for wireless clients similar to what I do for a large coverage area. You can pick up a decent dual band N300 netgear router with gigbit lan for around what it would cost to buy an N150 dedicated access point. Configure the router as an access point place it on the far end of wired lan and running on a different pair of channels than the Arris is using so they do not conflict. even if all your wireless devices are N150 or slower and cannot utilize the higher 2nd band of the AP the external antennae and better signal strength required to support it will give better performance. I had Comcast come out to my house...twice. They charged me $50 for one of the visits...but they didn't tell me about the charge before it appeared on my bill. They did NOT fix the "intermittent-on" problem. The firmware IS the latest version, and my wireless is *still* hanging at random intervals. This problem was reported in forums back in April of last year, with a previous firmware version. They have not been able to fix it in this entire past year...and I see no sign that they are even trying. The usual advice is to buy more equipment...another router to attach to the Arris gateway. Since I am retired, I don't *want* to buy more equipment, at my own expense, since I am paying them $7 for a device that is supposed to BE a wireless router. Nor do I want to get on that treadmill of constant Comcast changes, and "my" equipment changes and upgrades in response. I'm having the same issues, my xfinity modem is connected to my Netgear Nighthawk X6 AC3200 Tri-Band WiFi Router 802.11ac Tri-Band Gigabit (R8000) ( www.netgear.com/R8000) 3 rooms over, in a single story house. with the Nighthawk i have full bars at all times, but my internet connection drops every few min for some reason. 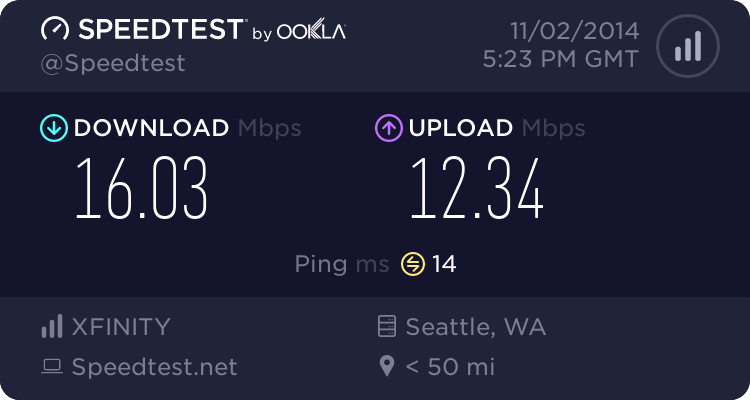 Comcast suport says it is my Nighthawk, but i took it with me to work and tested it out and it works flawlessly over a distance 3 times what i have here. So i know it's not my router. i just wished that comcast would get rid of ARRIS and either go with Cisco or Netgear, then all our issues would go bye-bye. With six high-performance antennas and three network bands, one 2.4GHz and two 5GHz, the Nighthawk X6 delivers the industry's fastest combined WiFi speed, up to 3.2 Gbps* (1300+1300+600 Mbps*). It balances the network load to ensure the best WiFi performance for each device and deliver the maximum wireless range available today. 1) Be sure that the ARRIS is in bridge mode by checking that the wifi light is NOT illuminating on the front of the gateway. 2) Connect a computer directly to the LAN port 1 on the ARRIS and check if the connection drops out (stream Netflix or something that needs a constant connection). 3) If it drops out, then its a problem with the ARRIS. Check your coax connections, you may need to exchange the modem. 4) If it does not drop out, then its a problem with the Nighthawk and the ARRIS not working well together. 5) Be sure the Nighthawk is connected with an ethernet cable, from its WAN port to LAN port 1 on the gateway. 6) Be sure that DHCP & NAT are enabled on the Nighthawk. 7) Contact Comcast to ensure the gateway is in full bridging mode. 8) If it still does not work, it has to be the Nighthawk because a computer connected right to the modem has a good connection. I use my laptop relatively close to the Arris so I don't have a wifi problem but I did have a problem using video players located in my bedrooms. No way the Arris could stream video over the distance involved. Solution was a cheap set of power lines. No buffering or pixelation problems. If you are using the 5GHz band you will not get the distance coverage of the 2.4GHz band. The only advantage of 5GHz is no interferance of neighbering wireless networks and of course the speed advantage near the router. I had similar problem with a TC8305C gateway. The only way to get my Netgear N750 to work was to get Comcast to switch the gateway to Bridge Mode as there is simply no way to turn off wifi and dhcp in the webpage setup for the TC8308C. Bad mistake! Problems after problems for abouty a month. My fix was I purchased my own modem, an approved Comcast modem, Arris TM822C Touchtone Docsis 3 non wireless from Amazon. The only trouble I had with comcast was getting the monthly modem rental removed from my bill. Please do NOT downgrade your security to WPA-TKIP. It can be easily (within minutes) broken and used to decrypt all your data by just capturing it in the air (read wifi sniffers). Whoever suggests this as an alternative just because their youtube videos stream quicker, is a blithering i***t. Keep security at a max WPA2-AES all the time !!! It's not so much a speed issue as it is a getting dropped all the time issue. I also have the Arris TG862 and until switching my security settings to WPA-PSK(TKIP) my wifi was nearly unusable. It's been stable so far but I just made the change this morning. Post removed due to a deliberate forum language filter circumvention violation. Please keep things clean and civil here and do not attempt to bypass the filter. Thank you. I've been testing a few different security modes and have found that I can use either WPA/TKIP or WPA2/TKIP and still have a stable connection. When I try to use any of the WPA2 connections that utilize either AES only or TKIP/AES my connection becomes unstable to the point it is useless. Note there is a huge difference in speed tests between any of the TKIP modes and AES. I hit 50Mbps with AES and seem to be averaging 15Mbps with TKIP. I have my TV connected to one of the LAN ports on the modem so Netflix and such work without using wifi. Given the expressed security concerns over using WPA I am going to stick with WPA2/TKIP. I really don't want to buy a wireless router to use with the Arris TG862G in bridge mode and with this configuration I am so far happy enough with the speed and stability. I placed this piece of excrement in the round file that Comcast almost forces us to use (returned it), and went out and bought my own modem for $60 on 7/25/2014. I haven't had any drops, lag, jitters, latency, and I am now getting the bandwidth that I’ve been paying for since since 12/01/2013. I noticed several people reporting stable wifi connections while using WPA/WPA2-PSK-TKIP/AES simply by setting the channel selection to manual and choosing channel 11. I decided to give this a try today as the WPA2-PSK/TKIP setting slows the download speeds considerably over wifi. Note that I also have to configure my windows laptops to use WPA2-personal/AES in order to see the higher speeds supported by AES. I've been running WPA/WPA2-PSK-TKIP/AES on channel 11 all morning with no issues so far. Hopefully this configuration will be stable as my wifi download speeds are averaging around 45Mbps and my connection has been very stable. Okay that didn't last long. Started getting dropped from wifi connections so reverted back to WPA2-PSK/TKIP security setting and am now slow but stable. BloodHoundTns, I am also grateful for dtomaselli's earlier post. As I have mentioned earlier, the relative stability with the tweaked security settings has been a welcome thing! The downside, as others have noted, is a speed penalty on wireless. I generally get about 12-15 Mbps - not horrible for most purposes, but far below the wireless speed that I would expect from the 50 Mbps Blast that I subscribe to. Before the security fix I was getting around 25 Mbps, but with horrible stability. I need to get around to getting a better router. Hi, Would you mind sharing what exactly you bought? I am having issues with this Arris TG862G. I am trying some of the solutions mentioned here. Thanks for letting me know I am not alone. Last week I installed the Arris TG862G/CT wireless gateway from Comcast. I wonder if this is a defective unit. I got a few devices to connect, but not all. The Wirelss Protected Setup (WPS) worked very reluctantly... to just ONE WPS caapable device. After going into the gateway setup and telling it to use b/g/n mode I managed to get my Brother wireless laser printer to connect. The WPS mode is not seen by my Motorola Android smart phone, or by my Toshiba Cloud HDTV, or by any other WPS enabled device. I could not get my smart phone of TV to connect in manual mode. Yes, I double checked the password, and made sure encryption modes etc were compatable. I finally put my Netgear N750 wireless dual band router back in my system. Its WPS mode worked flawlessly. Most of my home connections are now to the Netgear. I have one desktop PC connected to the Arris gateway, via ethernet and via 2.4 GHz wireless. That is all that I have had success with. The Arris thing does not seem to be offering 5 GHz as it is supposed to. BTW, I have changed channels as one attempted fix, but have the Arris back on Channel 1 my not auto channel mode. I have the Netgear N750 on a different channel. I spent about 4 ultimately useless hours on a chat with a COMCAST support person. We reset the Arris to factory, went through other settings, but with no improvement in connecting anything to it. He could not tell me what the WPS was not working. So, is this Arris TG862G/CT defective or just a piece of junk foisted on me by COMCAST? I suspect just junk since it is broadcasting SSID, have one PC connected, and I am OK using it to feed my Netgear N750. Comcast had me return my old modem & replaced it with an Arris TG862 modem but sent a booklet for the Wireless Gateway 2 which i now know that Comcast is using to trick customers into upgrading to the Xplatform or whatever with Tech fees & change all tv boxes & remotes so i owe device fees + more but they never said this is a cable modem & you will have to connect a router to get a guest account! What??? A wireless device that sends out signals should have a guest account without additional equipment being connected to this hugh box. In fact the local Comcast person said buy additional equipment & she doesnt know what a guest account is for? What rock did she crawl out from?I explained why people have & need guest accounts. This person should not work in a telecommunications office anywhere.I am asked for my guest password by everyone in my door.My other problems besides size and Guest accounts, Techs with backward compatability working in public, is the info given with a device if in paper form should match the device. Comcast trys to play dirty because they have no competition in my area. Im waiting so i can get a fair deal and modern equipment at a good deal.Anyone know a good way to connect additional routers or whatever to this thing(Arris Modem) i have to get a guest account without having to by a bunch of tv service & remotes i dont want from Comcast in Rome Ga.? Thanks dtomaselli, your solution worked for me like a charm!! Nobody answered. I am dumping comcast over this and the billing screws put to existing customers. I have a previous wireless hub. Can I do a full bridge to that? Do I just connect one port in my hub to a port on the Comcast hub? IMO it is worthless. I will be dropping phone service when the current pricing deal changes and getting my own docsis 3 modem with out phone if I decide to continue internet service at that time with them. If verizon was available to me I would have left a long time ago as they know how to give people good quality products to use. After spending two hours getting my old modem up and running again with comcast and all my home devices happy to be talking again, Comcast auto dialed me to say I should upgrade my modem! If only it had been a real person I could complain too. While this does not rate a FCC complaint it will get a few more shots at comcast and a general spreading it around AVS forum, the SiliconDust forum [where I specialize in advising people who have issues setting up their own CableCARD TV tuner with Comcast and others] and a few others that these are undesirable, may be the main issue regarding their setup problems and maybe they will stop trying to lock people into a modem that only works with devices you get from comcast or are able to change their IP address. I do feel is a violation of FCC rules if not in fact at least in spirit by providing devices that limits you to a specific ip address range of all the possible ranges any other company that make routers allows. I had truely hoped that this would have gone much easier and that the modem/router would have been as flexable as any router so that my devices would all work together as they had in the past but the promise vs performance factor is zip. Yes docsys 3 is fast than 2 but it means nothing if you can not talk to your networked devices. I could have put it in bridge mode and connected my old router but what is the point to having a built in router. Which is a serious problem if your wiring closet is in the basement. Sure, if I had a second set of coax/ethernet outlets in my office I could route the whole system up and then back down to the distribution blocks in the basement. Didn't happen taht way, since the builders took their time about framing the walls, then decided to frame *and* sheetrock the walls there the one day I didn't stop by. Doesn't matter anyway, since the Arris is sorely lacking in it's port-forwarding options. From what I could see, it can only forward ports to the SAME port number on the destination machine (on my DD-WRT router, and my Linksys router, I could redirect port 2299 externally to port 22 on my jumpbox internally). Seeing as it would take 2 hours or more to manually re-configure the Arris to match the network configuration I already had, it seemed wiser just to switch to bridge mode, and use my already-configured (and readily re-configurable) Linksys. It seems as if at some point The firmware/software was updated and rolled back again. For a few weeks I could not access the Arris status page at http://192.168.100.1 but could access the Comcast page at http://10.0.0.1 and it looked a little different. I should hve screencapped it. I could connect to my Roku but stll had intermitent drops but they werent as bad as before and I had full speed on wifi. Now today my Roku won't stay connected at all but I can acesss the Arris status page and the Comcast status page looks like it did before I noticed the different looking things. Time to slow this thing down again. GRRR!!!! That's what I have, again. I'm pretty sure it was updated and then rolled back cause the Comcast page at http://10.0.0.1 changes with each update slightly. Some time ago, I applied the security-setting tweak recommended in this thread and have been delighted with the wireless reliability I have enjoyed - very few drops. However, I have noticed that my wireless speed (I am on a 50 MB/s "Blast" tier) is significantly degraded. Plugging a laptop directly into the TG862G is giving me a consistent 40-45 MB/s, but the wireless is another story (below). So I am now thinking of putting the Arris into bridge mode and getting my own wireless router. Does anyone have a recommendation for such a router? Do I need to stick to Comcast's 'approved' list, or is the list more relevant for modems? The wireless test was done in the room right next to the Arris, by the way. we were having same problem of wifi disconnecting constantly after switching to arris 2-in-1 modem, with multiple unhelpful chats with comcast. wired into the arris, internet speeds were fine. so problem was wifi, not actual internet connection. ...thanks, dtomatelli. security setting change (from default to WPA-PSK (TKIP)) and setting channel seemed to fix problem of wifi disconnects. but, it made wifi speed from from about 52 mbps to about 19 mbps. so, changed security setting to WPA2 PSK-AES (per some other forum threads), and speed went back up to over 50. and now we can stream videos over wifi without constant shut-downs. thanks, all for helping puzzle through this stuff! no teniendo ostaculos en la distancia..informe a Comcast. estubieron configurando y probando pero nada...Sigue el problema. lo mismo sucede con la senal usando el telefono..este moden Arris TG862G NO TIENE PODER DE WI-FI..
Que me pueden recomendar ?????.. Gracias..